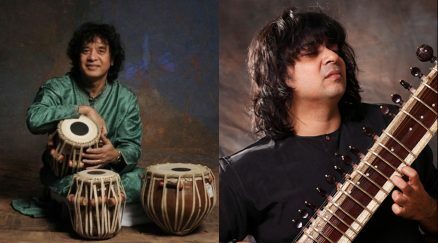 One of the world’s greatest percussionists, tabla legend Zakir Hussain joins forces with the young sitar maverick Niladri Kumar for an extraordinary evening of Indian classical music. A masterful improviser and classical tabla virtuoso of the highest order, Zakir’s brilliant and exciting performances have established him as a national treasure in India, and brought him worldwide admiration through his historic collaborations with the likes of the Grateful Dead’s Mickey Hart, John McLaughlin, Pharoah Sanders, Charles Lloyd, Yo-Yo Ma and Bela Fleck. He will be joined by Niladri Kumar a 5th generation sitar player who is known for his deep knowledge of the classical repertoire while infusing innovative new sounds and ideas to the ancient tradition—including creating the electric zitar. This concert marks the opening event of The India Center Foundation, a non-profit organization dedicated to the study and celebration of Indian culture as well as the exploration of India’s place in the world and relationship with the United States. For more information please visit theindiacenter.us.